As most of us in the trading gold are aware, gold is a rare metal used as money, and considered to be a hedge against inflation, currency failure, recession, and other uncertainties factors. The fluctuation of gold price is affected by many factors; the US dollar index is the one of them. If you are considering whether to invest in gold or have already invested in gold, it is essential to understand the close relationship between the price of gold and the value of US dollar. 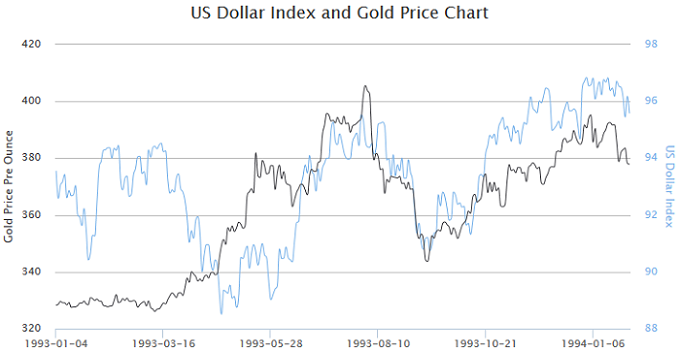 Grasping the relationship between gold price and US dollar index can help make the most advantageous investment decisions. Anyone who takes attention on gold and currency markets closely will find that the Gold Price and Dollar Index generally trend in negative correlation. First of all, historical speaking, gold and silver were used as currencies in the past. The value of a unit of US dollar was originally tied to the value of a specific amount of gold or silver. However, during the periods of Civil War, the First World War and the Great Depression, this relationship was temporarily cut in order to protect the gold reserves. After ended the Bretton Woods system in the early 1970s, the US dollar became a true fiat currency allowing to be freely traded and sold. Secondly, gold and the dollar are considered as global currencies. Many foreign banks hold dollars as a reserve currency, or invest more in gold to preserve their assets during volatile economic conditions. When the dollar weakens, banks as well as investors around the world buy more gold to protect their money and hedge against the U.S. dollar weakness; when the dollar strengthens, more and more investors and banks invest U.S. dollar to discard gold. Due to the fall in demand, the value of gold depreciates. This choosing of investors brings about negative relationship between gold and the US dollar. In addition, the value of gold is commonly expressed as US dollars per ounce; therefore, any fluctuations of dollar are likely to affect the dollar price of gold. As the dollar rises, the gold price in dollar falls, and vice versa. It is worthwhile to note that the value of gold is unlikely to inversely fluctuate exactly in line with the value of US dollar. In fact, this reciprocal relationship is generally not obvious in a short period, but is almost obvious during periods of 12 months or longer. 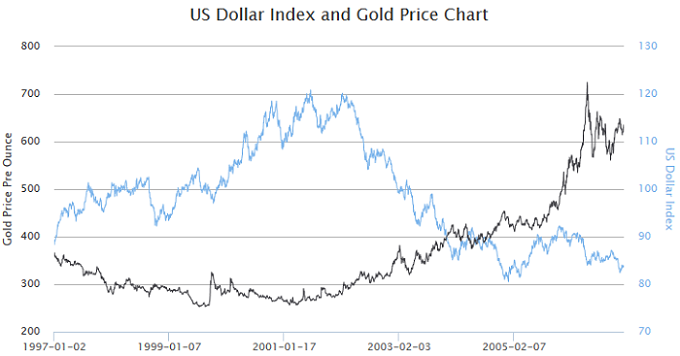 As illustrated from January 2001 to January 2004, the price of gold and US dollar index had a strong negative relationship. Do the gold and dollar index always have an inverse relationship? It is obvious not! Historically speaking, in some periods the price of gold and US dollar index had a strong positive correlation. For instance, as illustrated from May 1993 to December 1993, they broke down the traditional inverse relationship. In fact, besides the interaction between gold price and US dollar index, there are many other external factors also impact the price of the two. Such as in a war period, some people might buy more gold to keep value, whereas others might think that purchasing US dollar was a safer way to keep value. The behavior of people might create gold price as well as US dollar index to rise.